A solid wooden bed handcrafted by aarsunwoods that are designed using prime high quality wood.This furniture is perfect to complete the look of your home. Add refined elegance to your room with this beautifully crafted bed. 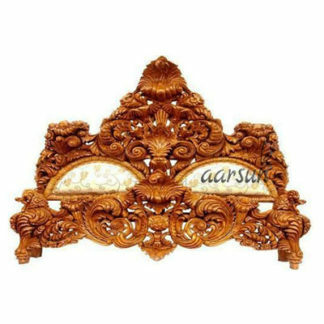 The traditional and elegant carving design belonging to classic category reflects the vintage philosophy perfectly well. The head board is made straight for optimal support, while the base frame is made out of teak wood to ensure no sagging, shrinking, or swelling. The base cavity holds the mattress in place for composure and adequate rest. 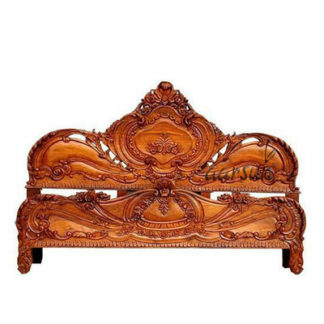 This wooden bed is strong and available with huge durability. Traditional hand carving designs in all their essence are utilitarian and carefully crafted to enhance the life of the furniture. The wooden beds are carefully and lovingly designed with your comfort and the environment in mind. . This wooden bed is made from teak wood. The finish can be selected out of a list that has options like natural, walnut and dark walnut. These beds are available in options such as Sheesham and Teak. You can also customize the size as well as finish of the bed to blend it as per your home decor. These wooden beds are also available in several designs. Its finest artwork and high grade wood with finish, changes the look of the bedroom. Our handmade wooden beds are available in different colors, grains and harnesses. We are considered some of the largest manufactures, exporters and supplier of wooden beds in India. Our wooden beds are made to order using traditional carpentry techniques, ensuring a unique piece of furniture that is both beautiful and extremely strong, yet easy to assemble in your home. Available in all sizes, including four-poster, king size, queen size, double and single. This bed is long lasting, durable and very strong as it is made from one of the best quality teak wood.